Harner Farm is fortunate to enjoy several other species. From rabbits – that entertain the Beagle and the Baygle– to many species of birds who enjoy the great habitat provided by our shrubs, trees, bird feeders and even a heated waterer in winter. Cherry and Sherri check out Sooner - the new cat on the farmstead. Sooner is our latest addition. On a cold December evening I got a call from a neighbor across the highway wondering if I'd lost this black, very friendly cat. He was in her garage, but she had three spays in the house and didn't want to let him in further, so he got a bed and food and water and a warm place to sleep. I called her back a few minutes later and said he could live in our barn, pending finding his owner. The neighbor brought him over the morning of Christmas Eve. He was an intact tomcat, but very, very friendly and well-mannered with a silky coat and extra-long tail. The first time he saw me milking and got a taste of fresh, warm goat's milk - this cat knew he'd found a good deal. As for a name – after going through dozens of names we decided to call him Sooner. We’d finally decided we had to name him Sooner or Later. But if we named him later, it would never get done. So Sooner he is! Sooner has now been neutered and in case you’re wondering how long it takes for an adult tomcat to revert to kittenhood after neutering the answer is – six days. That morning we found him tossing kitty toys up in the air and chasing them up and down the steps. It's fun to see fourteen pounds of fur chasing a yarn toy. Proving that it never hurts to do a good deed....when my neighbor bought over Sooner, I gave her a sampler of our goat cheese. She was delighted and mentioned that she used to substitute milk for a friend when she lived in Wyoming and that person gave her cheese. I had no idea there was an experienced milker living so close. Immediately - we struck the same deal! 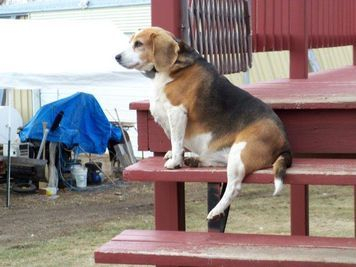 Keiko is our Beagle who never met any food she didn’t like….except for vegetables. She didn’t get this “robust” body from what we were feeding her. Instead, she loves to live off the land, sniffing up guinea egg nests in the summer. She trails bunnies and tells us whenever something isn’t in the right place. Here she's siting on the deck watching for anything that might not be just right. Here Keiko is checking out Millie’s ability to function as a treat machine and drop delectable little pellets. 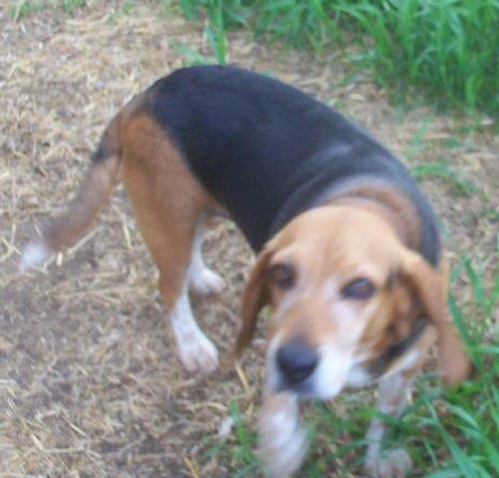 Meet our "Baygle" JEWEL, who is a cross between a Bassett Hound and a Beagle. Jewel joined the family on Memorial Day, 2018.She's a six year old spay.who was raised on a farm with chickens and ducks. 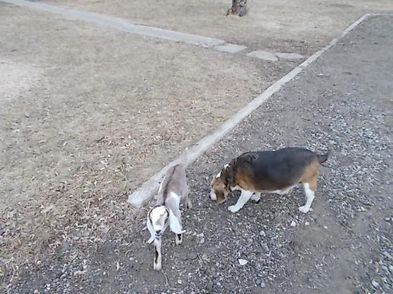 When we went to pick her up from a different farm we learned she was familiar with Nubian goats, too. She loves to hunt rabbits and takes off on a run with her long ears flapping in the breeze. Keiko follows behind as quickly as her old, stout body allows. Meet Calvin. 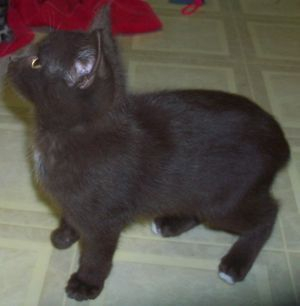 He has a natural bobtail. Sweet and mischievvous, when he doesn't come when I call "Calvin," I then try "Spaceman Spiff" (just like the cartoon) and he'll often respond.